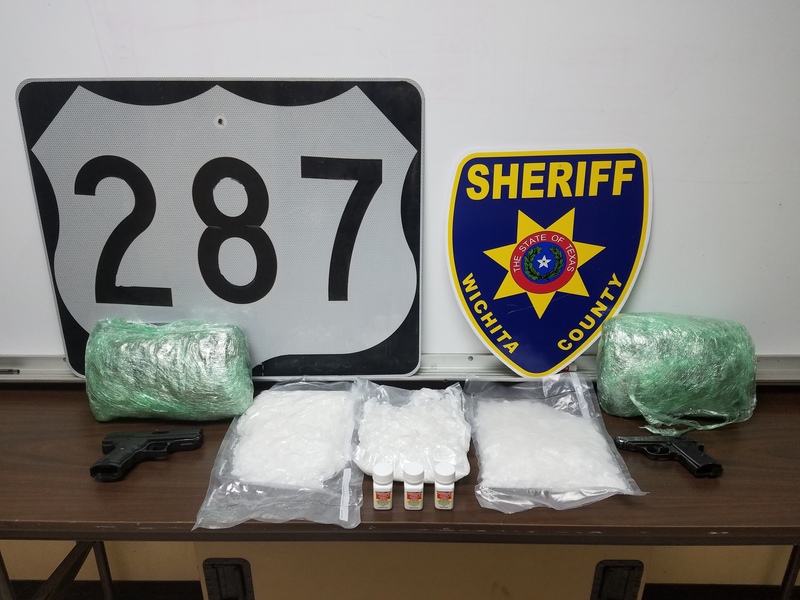 On Thursday April 27, at approximately 2:05 pm, a Wichita County Highway Interdiction Deputy made a traffic stop at the intersection of U.S. 287 and Burnett Ranch Road. The 30-year-old female driver, Kimberly Brown, a 40-year-old male passenger, Rosario Obera Jr., and a 30-year-old male passenger, Dimitri Sawtelle, were placed under arrest. They were transported to the Wichita County Detention Center and were charged with Possession of a Controlled Substance PG 1 over four hundred grams and Possession of Marijuana over four ounces under five pounds. Six Pounds of Methamphetamine, two pounds of Marijuana, seventy-eight grams of Liquid Methamphetamine and two handguns were seized. On Thursday April 27, at approximately 2:05 pm, a Wichita County Highway Interdiction Deputy made a traffic stop the intersection of U.S. 287 and Burnett Ranch Road. The 32-year-old female driver, a 40-year-old male passenger and a 30-year-old male passenger were placed under arrest. They were transported to the Wichita County Detention Center and were charged with Possession of a Controlled Substance PG 1 over 400 grams and Possession of Marijuana over four ounces under five pounds. Six pound of Methamphetamine, two pounds of Marijuana, seventy-eight grams of Liquid Methamphetamine and two handguns were seized. On Friday April 28, at approximately 12:01 am, Sergeant Mark Whipple checked an unoccupied vehicle in the parking located in the 7400 block of Northwest Frwy. in Iowa Park. The vehicle was found to be stolen. On Friday April 28, at approximately 1:43 am, Deputy Amanda Price made a traffic stop at the intersection of Hughes and McNiel. The 23-year-old female driver was placed under arrest. She was transported to the Wichita County Detention Center and was charged with Driving While Intoxicated. On Tuesday April 25, at approximately 11:30 am, Deputy Scott Chapel observed a small child playing next to the roadway in the 4500 block of Spencer. Child Protective Services was contacted and upon a representative’s arrival, the investigation was turned over to them. On Tuesday April 25, at approximately 10:48 am, Deputy J.T. Mitchell responded to the 2000 block of Wranglers Retreat in reference to a Burglary of a Habitation. Upon arrival, the Reporting Person reported that an unknown person(s) entered the property and stole a Delta Chop Saw valued at $250.00, assorted hand tools valued at $150.00, a turkey fryer valued at $100.00 and miscellaneous ammunition. On Wednesday April 26, at approximately 12:00 am, Deputy Gabriel Villarreal responded to the 1800 block of Bell Road in reference to a Check Welfare. Upon arrival, the resident reported that there was a disturbance at the residence on April 19. The Wichita County Sheriff’s Office is now hiring Detention Officers. If you are interested in a fun and rewarding career, you can pick up an application at the Sheriff’s Office located at the Wichita County Courthouse, 900 7th Street or contact the Training Unit at 940-766-8100 ext. 8254. On Monday April 24, at approximately 10:32 pm, Deputy Jason Vandygriff made a made a traffic stop at the intersection of Ave K and Grant. The 18-year-old male driver was issued citations for No Drivers License and Failure to Maintain Financial Responsibility. The vehicle was impounded. On Monday April 24, at approximately 10:00 am, Deputy Kristian Valdez took a report of a stolen vehicle. The Reporting Person reported that an unknown person(s) stole a 2000 Harley Davidson Road Glide Motorcycle valued at $15,000.00 from the intersection of U.S. 287 and Business 287. On Monday April 24, at approximately 5:28 pm, Deputy Greg Wilson made a traffic stop in the 400 block of Wellington Lane. The 34-year-old male driver was placed under arrest. He was transported to the Wichita County Detention Center and was charged with Driving While License Invalid. On Monday April 24, at approximately 9:35 am, Deputy J.T. Mitchell responded to the 3600 block of River Road in reference to a Criminal Trespass. Upon arrival, the Reporting Person reported that subjects are trespassing on his property. On Thursday April 20, at approximately 10:21 pm, Deputy Brett Brasher made a traffic stop at the intersection of Seymour Hwy. and Brook. The 37-year-old male driver was placed under arrest. He was transported to the Wichita County Detention Center and was charged with Possession of a Controlled Substance PG 1 over one gram under four grams. On Friday April 21, at approximately 9:58 pm, Deputy Daniel Jacobson made a traffic stop in the 1000 block of Central Frwy. The 28-year-old female driver was issued citations for No Drivers License and Failure to Maintain Financial Responsibility. The vehicle was impounded. On Friday April 21, at approximately 4:56 pm, Deputy Daniel Jacobson made a traffic stop at the intersection of Spur 447 and 12th Street. The 29-year-old male driver was issued citations for No Drivers License and Failure to Maintain Financial Responsibility. A 21-year-old male passenger was issued a citation for Possession of Drug Paraphernalia. The vehicle was impounded. On Friday April 21, at approximately 5:49 pm, Deputy Jason Vandygriff responded to 610 Holliday in reference to an Assault. Upon arrival, the Reporting Person reported that she was assaulted while travelling in a vehicle near the intersection of Texowa and F.M. 367. On Friday April 21, at approximately 10:12 pm, Deputy Cole McGarry responded to the 4700 block of Goetz Road in reference to a Burglary of a Building. Upon arrival, the Reporting Person reported that an unknown person(s) entered the property and forced open a door to a shop and a travel trailer. Once inside a Stihl weed eater valued at $150.00, a Schumacher Battery Charger valued $40.00, a Rigid Shop Vacuum valued at $50.00, a leaf blower valued at $20.00 a 100 foot extension cord valued at $80.00, a 20 food heavy duty extension cord valued at $200.00 and a generator were stolen. On Friday April 21, at approximately 11:59 pm, Deputy Cole McGarry responded to the 5200 block of Sisk Road in reference to an Animal Complaint. Upon arrival, ten horses were found in the roadway. They were placed in a nearby pasture until the owner could be contacted. On Sunday April 23, at approximately 7:44 am, Deputy Jeff Lee and Deputy J.T. Mitchell responded to the 1600 block of Cameron Lane in reference to a Medical Call. Upon arrival, a 70-year-old male was transported to United Regional Health Care by American Medical Response. On Sunday April 23, at approximately 6:05 pm, Deputy Jeff Lee responded to the 3100 block of Midwestern Parkway in reference to a Theft. Upon arrival, two juvenile females were barred from the property. On Sunday April 23, at approximately 9:47 pm, Deputy Greg Wilson and Deputy Lance Brumley responded the intersection of Peterson Road and Wyeth School Road in reference to a vehicle blocking a driveway. Upon arrival, a 36-year-old male was barred from the property. On Tuesday April 18, at approximately 11:56 pm, Deputy Cole McGarry, Deputy Kristian Valdez and Deputy Amanda Price responded to the 1600 block of F.M. 368 South in reference to a Burglary of a Habitation in Progress. Upon arrival, the residence was checked and no signs of forced entry were revealed. On Thursday April 20, at approximately 1:47 am, Deputy Amanda Price made a traffic stop in the 1700 block of Midwestern Parkway. The 19-year-old male driver was placed under arrest. He was transported to the Wichita County Detention Center and was charged with Driving While Intoxicated. On Tuesday April 18, at approximately 6:11 pm, Lieutenant Patrick McFerrin responded to the 8000 block of Tica Road in reference to a Disturbance. Upon arrival, a 20-year-old male was barred from the property. On Tuesday April 18, at approximately 4:33 pm, Deputy Greg Wilson responded to the 100 block of F.M. 369 in reference to a Harassment Report. Upon arrival, the Reporting Person reported that a subject harassed him while he was driving along the roadway and then attempted to run him off the roadway with a vehicle. On Tuesday April 18, at approximately 7:32 am, Deputy Roy Biter responded to the 3500 block of F.M. 369 in reference to a Theft. Upon arrival, the Reporting Person reported that an unknown person(s) cut a lock on a gate and entered the property. The Reporting Person reported that the subject(s) then stole a Kubota tractor with a pulverizer and lifting forks valued at $43,500.00. On Tuesday April 18, at approximately 10:56 pm, Deputy Amanda Price and Deputy Cole McGarry responded to the 8500 block of Seymour Hwy. to serve an arrest warrant. Upon arrival, a 41-year-old male was placed under arrest. He was transported to the Wichita County Detention Center and was charged with three outstanding warrants for Capias Pro Fine-Operate with License for other class vehicle, Capias Pro-Fine-No Drivers License in Possession and Capias Pro Fine-Failure to Maintain Financial Responsibility. On Wednesday April 12, at approximately 11:25 pm, Corporal Ralph Burdick made a traffic stop at the intersection of Martin Luther King and Jefferson. The 44-year-old female driver was placed under arrest. She was transported to the Wichita County Detention Center and was charged with an outstanding warrant for Theft of Service. On Thursday April 13, at approximately 10:49 pm, Deputy Daniel Jacobson made a traffic stop in the 2400 block of Iowa Park Road. A 39-year-old female passenger was placed under arrest. She was transported to the Wichita County Detention Center and was charged with Possession of a Controlled Substance PG 1 less than one gram. On Thursday April 13, at approximately 10:31 pm, Deputy Matthew Schenck made a traffic stop in the 100 block of North Beverly. The 37-year-old female driver was placed under arrest. She was transported to the Wichita County Detention Center and was charged with Driving While Intoxicated 2nd Offense and an outstanding warrant for No Drivers License in Possession. On Thursday April 13, at approximately 9:44 pm, Deputy Daniel Jacobson made a traffic stop in the 1300 block of Scott. A 52-year-old male passenger was placed under arrest. He was transported to the Wichita County Detention Center and was charged with an outstanding warrant for Contempt-Non Payment of Child Support. On Thursday April 13, at approximately 11:00 am, Sergeant Sergio Teruel made a traffic stop at the intersection of Seymour and Baylor. The 41-year-old female driver and a 24-year-old female passenger were placed under arrest. They were transported to the Wichita County Detention Center. The driver was charged with Unauthorized Use of a Motor Vehicle. The passenger was charged with an outstanding warrant for Violation of Probation-Prostitution. A stolen vehicle was recovered. On Friday April 14, at approximately 8:18 pm, Deputy Brian Koschak made a traffic stop at the intersection of Martin Luther King and 3rd Street. The 43-year-old female driver and a 48-year-old male passenger were placed under arrest. They were transported to the Wichita County Detention Center and were charged with Possession of a Controlled Substance PG 1 over one gram under four grams. On Friday April 14, at approximately 10:27 pm, Deputy Jason Vandygriff and Deputy Cole McGarry responded to the 1700 block of Vaughn Road in reference to a Threat. Upon arrival, the Reporting Person reported that he had received a threatening text message from a subject. On Friday April 14, at approximately 12:00 am, Corporal Ralph Burdick made a traffic stop in the 600 block of Van Buren. The 38-year-old male driver was placed under arrest. He was transported to the Wichita County Detention Center and was charged with Possession of Marijuana under two ounces. On Saturday April 15, at approximately 11:40 am, Deputy Jeff Lee made a traffic stop in the 1000 block of Van Buren. The 56-year-old female driver was placed under arrest. She was transported to the Wichita County Detention Center and was charged with Possession of a Controlled Substance PG 1 under one gram in a Drug Free Zone and an outstanding warrant for Credit Card or Debit Card Abuse. On Saturday April 15, at approximately 2:15 am, Deputy Amanda Price attempted to stop a motorcycle at the intersection of Southwest Parkway and McNiel. The motorcycled fled on Southwest Parkway and then north on Barnett Road. The deputy lost sight of the motorcycle on Barnett Road. On Saturday April 15, at approximately 3:58 am, Sergeant Mark Whipple stopped an individual walking in the 2300 block of Jacksboro Hwy. The 28-year-old female was placed under arrest. She was transported to the Wichita County Detention Center and was charged with Failure to Identify-Fugitive from Justice and an outstanding warrant for Endangering a Child. On Saturday April 15, at approximately 8:01 pm, Deputy Joshua McGuinn responded to the 1700 block of Cameron Lane in reference to a Disturbance. Upon arrival, a 30-year-old male was placed under arrest. He was transported to the Wichita County Detention Center and was charged with Failure to Identify-Fugitive from Justice and an outstanding warrant for Bond Forfeiture-Driving While Intoxicated. On Monday April 10, at approximately 9:39 pm, Deputy Jason Vandygriff made a traffic stop at the intersection of 3rd and Farris. The 42-year-old male driver was issued a citation for No Drivers License and Expired Vehicle Registration. The vehicle was impounded. On Tuesday April 11, at approximately 9:30 pm, Sergeant Lee Crossman made a traffic stop at the intersection of East Scott and Peach. The 33-year-old female driver was issued a citation for Driving While License Invalid, Expired Vehicle Registration, Expired Drivers License and Failure to Maintain Financial Responsibility. The vehicle was impounded. On Friday April 7, at approximately 8:04 pm, Deputy Daniel Jacobson responded to the 1200 block of Vaughn Road in reference to a Theft. Upon arrival, the Reporting Person reported that an unknown person(s) stole a 2000 Chevrolet Cheyenne Pickup that was parked in front of the residence. On Friday April 7, at approximately 1:15 pm, Deputy Jeff Lee made a traffic stop in the 1900 block of Sheppard Access Road. A 53-year-olde male passenger was placed under arrest. He was transported to the Wichita County Detention Center and was charged with Violation of Protective Order. On Saturday April 8, at approximately 1:25 am, Deputy Amanda Price made a traffic stop at the intersection of Greenbriar and Mesquite. The 35-year-old female driver was placed under arrest. She was transported to the Wichita County Detention Center and was charged with Possession of a Controlled Substance PG 1 less than one gram, Possession of a Controlled Substance PG 3 under twenty eight grams and Possession of Marijuana under two ounces. On Saturday April 8, at approximately 3:54 pm, Deputy Kristian Valdez, Deputy Matthew Schenck and Deputy Brett Brasher responded to the 3900 block of F.M. 369 in reference to a Burglary of a Habitation. Upon arrival, the Reporting Person reported that an unknown person(s) entered a residence and removed a set of keys to her 2001 Chevrolet Tahoe and then entered a locked shop and stole the vehicle. On Sunday April 9, at approximately 12:20 pm, Deputy Christopher Salas responded to the 8000 block of F.M. 171 in reference to an Animal Complaint. Upon arrival, the Reporting person reported that a pig appeared on his property. The animal was impounded after the owner could not be located. On Sunday April 9, at approximately 9:36 am, Deputy Roy Biter made a traffic stop at the intersection of Central Frwy. and Maurine. The 25-year-old male driver was placed under arrest. He was transported to the Wichita County Detention Center and was charged with two outstanding warrants for Driving While License Invalid and Violate Promise to Appear. On Monday April 10, at approximately 12:30 am, Corporal Jeff Penney made a traffic stop at the intersection of 10th Street and Broad. The 19-year-old male driver was placed under arrest. He was transported to the Wichita County Detention Center and was charged with Prohibited Weapon-Knuckles.